Jeffrey Campbell was established in 2000, as a family-owned corporation operating out of Los Angeles. Popular for their vintage styles combined with a daring touch, JC shoes are prized for their novelty. The Jeffrey Campbell shoes for 2012 are a delightful mix of retro styles and audacious designs. Delightful oxfords, wedges, platforms, clogs, and boots are enough to make any woman drool. For those with eclectic tastes, the Damsel Studded Wedge costing €120.57 or the Lita All Over Spike in black or silver selling for €240 are winners. The latter is a classic punk style embellished with spikes and pyramids on the sides along with a 5-inch heel. 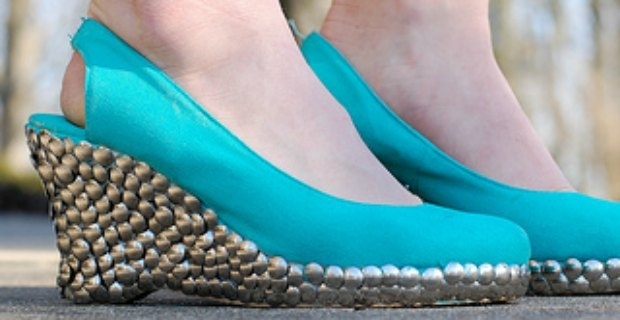 Watch as these shoes command double takes from your friends or passers-by. There are also fascinating pieces for the fall/winter collection spelling zest. Bold animal prints abound in knee-high boots with eyelet laces for an exotic yet downtown feel. Closed toe wedges in autumn hues will turn that Indian summer into a feeling of colourful madness with splashes of green, orange, and yellow. These slingback wedges feature 5-inch heels, giving some posh and glamour to outfits. JC also presents sandals in multi-layers of colours making them easy to match outfits that go with the season or occasion. And if you’re worried about getting those lower extremities protected from the elements, there are platform shoes that not only add inches to your height but are truly comfortable for walking. And, they’re in attractive colours, too. Get into the groove with plaid pattern shoes or go classic and pick up a pair of black boots. Jeffrey Campbell also makes wonderful accessories that go with these creative, vintage-inspired shoes. Take the Ian West clutch bag made from real leather. It packs a punch with its roomy interior, front lap with magnetic closure, and zipper pockets. A real attention grabber is the bright orange Abbate Three Strap Bag perfect for downtown outings. From daring shoes to unique handbags, there’s a JC product out there for you. The only thing is, watch out for your bank balance as it can get quite addicting. And, the men have to wait for their turn. Currently, there are only women's shoes on sale.